“Things are better, relatively speaking.” Rosaline Kaimbay emphasized the “relatively speaking” when I called yesterday for an update on Bumpeh Chiefdom. But it was the first positive news in some weeks. 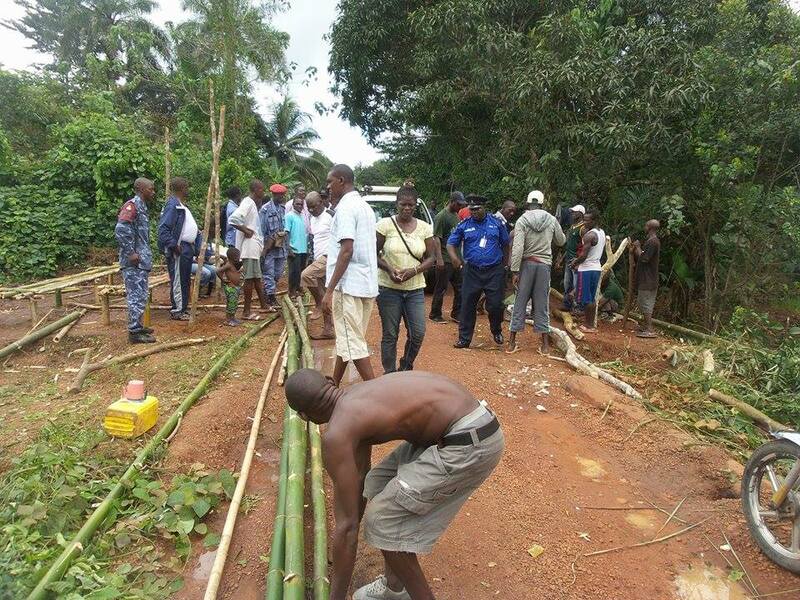 There are no more Ebola cases in the chiefdom since they embarked on their Breaking-the-Chain-of-Transmission program two weeks ago. Yet Ebola is raging in Waterloo, a large town on the main highway and the source of recent Ebola cases in Bumpeh Chiefdom. There are reports of over 700 dead of Ebola in the Western Rural area in the last 5-6 weeks, most coming from Waterloo. Ebola “refugees” have been fleeing places like Waterloo and carrying Ebola to rural villages. Places like Bumpeh Chiefdom in close proximity. Setting up a check point. But today there’s no Ebola cases in Rotifunk or the rest of Bumpeh Chiefdom. Why? The single biggest intervention is rigorously managed checkpoints at the main roads to stop “strangers” from entering the chiefdom and possibly carrying Ebola with them. There are also checkpoints on the Bumpeh River that traverses the chiefdom and is the main traffic route for many of its 208 villages “downriver” as they say. Young chiefdom men volunteered to supplement government security forces at checkpoints and monitor all traffic in and out of the chiefdom. They’re the ones rigorously enforcing, keeping chiefdom borders tight, and ensuring outsiders are turned away. They’re the ones sitting up for all night vigils with nothing to protect them from mosquitos except a camp fire. They take turns for naps in a 3-sided palm branch lean-to on hard benches of split bamboo – their improvised shelter. 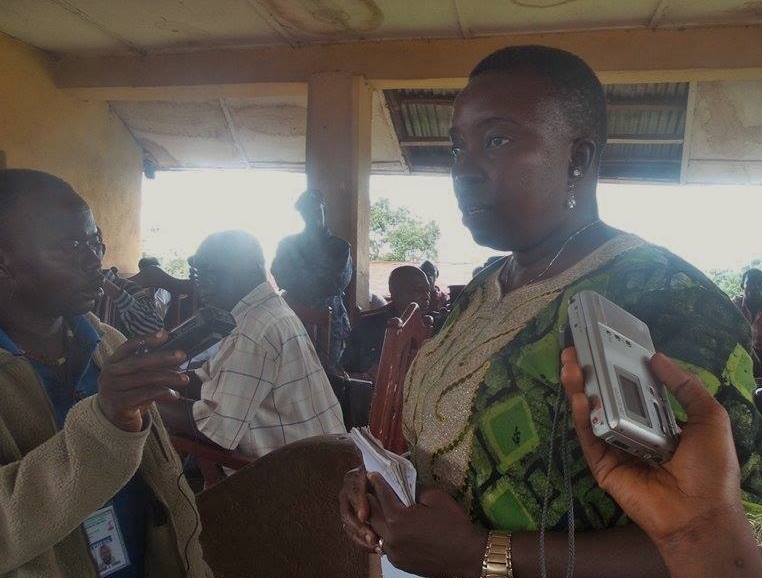 Rosaline Kaimbay interviewed at chiefdom meeting. Rosaline visits the checkpoints daily to be sure all is going well and lend support. She is Executive Director of Sherbro Foundation’s partner organization, the Center for Community Empowerment and Transformation, CCET, and principal of Prosperity Girls High School. And now, she’s part of the chiefdom’s Ebola task force. Rosaline is a do-er. If you need something done, get Rosaline. If it’s important to Bumpeh Chiefdom, you won’t need to look for her. She’ll be there. Rosaline said she goes to the checkpoints daily for at least 30 minutes, maybe an hour, to personally assess. She heads out each day with the CCET motorcycle and a driver, the only practical way to get around these days. Maybe the only way. We have six chiefdom men assigned to each checkpoint, Rosaline said. They rotate through, with five days on and two days off. I talk with people, bring them drinks, something to boost morale. And the checkpoints are working. I asked what they do if someone tries to enter the chiefdom who doesn’t live there. They send them back where they came from, she said, the way they came in. 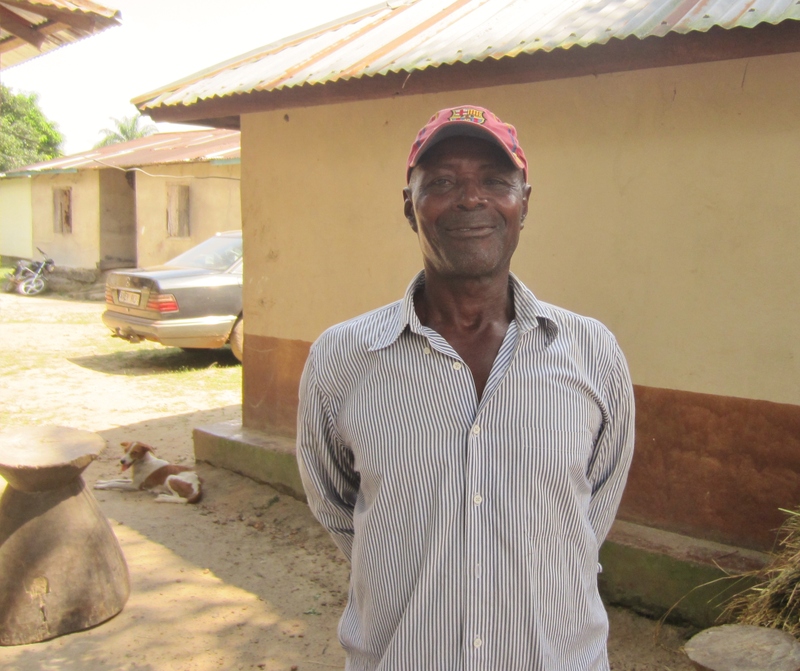 Chiefs like Mr. Kamara monitor village families. It sounds rather medieval. But much of the country is under similar isolation orders, trying to isolate districts, and chiefdoms within districts, that have surges in new Ebola cases. This is Public Health 101 to isolate disease cases and keep them from spreading. It works. Village chiefs are the next level of defense in the Breaking-the-Chain-of-Transmission program. Bumpeh Chiefdom chiefs are going door to door daily to verify no one has taken ill with Ebola-like symptoms, and there are no new visitors. Reports are by cell phone real time, wherever possible. Section Chiefs are responsible to report their village results to the Chiefdom task force. Imagine if every chiefdom in the country mounted this kind of offensive to fight Ebola for even 21 days – the upper range for Ebola incubation. It would literally break the chain of Ebola transmission and the outbreak would be on its decline. Identify – Isolate – Treat. If all three legs of the infectious disease control stool were reliably there, Ebola would come under control. Actively engaging and supporting traditional leaders to identify and isolate cases in their chiefdoms is the key. They play a role in getting cases promptly sent for treatment. No one else can do this systematically with cooperation of the people. No one else is already in place in every corner of the country. There’s still a long uphill battle to eliminate Ebola. But for the first time in a long while, you get a sense the runaway train is starting to be controlled and slowing down. Sherbro Foundation will continue to support Bumpeh Chiefdom in their Breaking-the-Chain-of- Transmission program. Our donations go to support the checkpoints teams with small weekly per diems, transportation costs and cell phone coverage. Village chiefs receive a $5 honorarium to recognize their service for three months of house to house checks. With gas at $5/gallon, transportation costs are high. Our support enables the Chiefdom task force to get around and ensure work gets done. We continue to supply villages with hand washing stations and disinfectant for public places. You’ll know exactly where your money goes, and that it’s actually working to stop the spread of Ebola. Bonus: 100% goes directly to the chiefdom Ebola program. Every penny. We’re an all-volunteer organization and our small administrative costs are paid by a separate donation. 2nd Bonus: It’s tax deductible for US residents. Sherbro Foundation is a 501(c)(3) tax exempt organization. Help us even more – forward this to a friend.